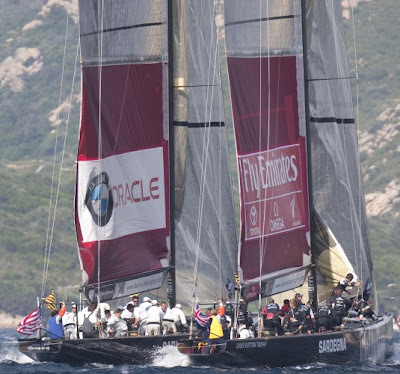 Racing has been abandoned for the day and early this afternoon, the Louis Vuitton Trophy La Maddalena organisers issued a Notice to Competitors canceling racing on Monday. The forecast Mistral conditions are pretty definitive. But today's race offered up plenty of eye candy. 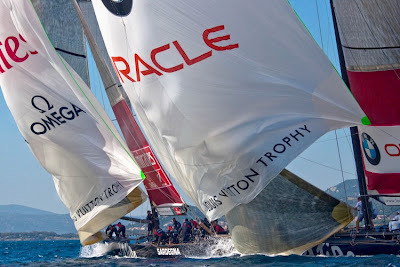 Below are a few shots from our old friend Bob Grieser - Louis Vuitton Trophy / OutsideImages. There are plenty more of them on the event website image gallery here.